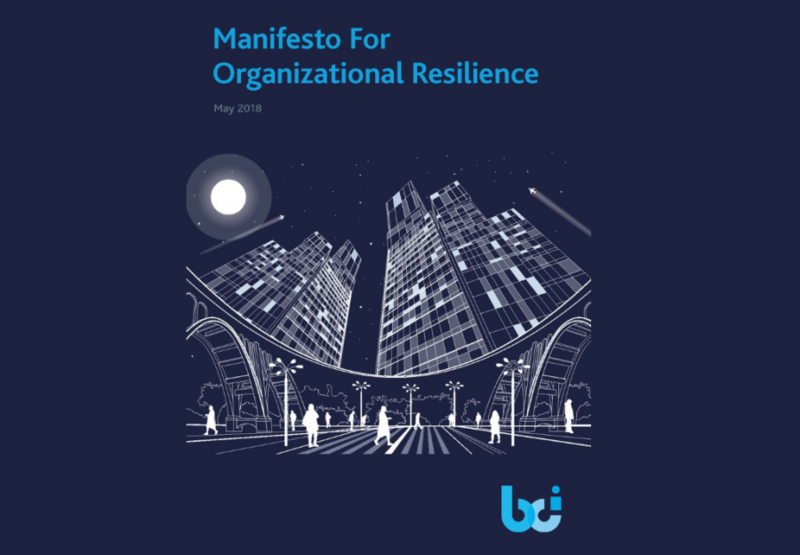 Charlie shares his thoughts on the Business Continuity Institute’s “Manifesto for Organizational Resilience”, which was released as part of Business Continuity Awareness Week. This week I have been rushing around, so I haven’t really been following Business Continuity Awareness week too closely. One item that caught my eye was the Business Continuity Institute’s “The Manifesto for Organizational Resilience” which was launched this week. I am not entirely sure what a manifesto is, so I cannot really comment on whether it is a good manifesto or not! Manifestos seem to be a trendy way of promoting an idea these days, so perhaps we can say the The BCI is “on trend”! The document has three parts, which are new or which deal with the subject of resilience. 1. The BCI pledge – this is what the BCI are going to do to fulfil their part of the manifesto. 2. What is organisational resilience? 3. A case study which is meant to support the narrative. I will discuss the three parts in order. The BCI pledge. This seems to be the most important part of the document and takes us somewhere new. The first item is to champion academic research and I think this is an excellent idea. I have recently been teaching a Master of Science (MSc) degree module on Crisis Management and Business Continuity. During this time, I have had to tell students that there is very little academic work on business continuity. There is however, an immense amount of work and comments on the process of business continuity and how best to carry it out. This varies from a series of how to books, to blogs and articles aligned to the ISO standards. At all times they are written by “opinionated amateurs” who have a way of doing business continuity or have an opinion on how to deliver business continuity and want to share their ideas with others. All slightly vying with each other to be seen as the ultimate BC guru. I fall into this category as well! There are plenty of MSc and undergraduate courses around, so there should be enough people to undertake research and bring some new academic rigour to the profession. I also like the commitments stated in the pledge to work closer with other organisations. However, we need to remember all organisations, including the BCI, have to make money and are all in competition with each other. They need to keep their members and fill their conferences. I suspect collaboration might only go so far. Practice groups are fine, but I imagine these groups get filled with the usual suspects; the retired, the under-employed and those with an agenda to push. Those who should be in the groups are working full-time in the industry and don’t have the luxury of time to sit in on them. I like the idea of an online resilience tool, but we will see what happens. I still struggle with the definition of resilience. I completely understand the idea of professions working together and taking a holistic view of risk, incident management and awareness training across the organisation. However, I can’t understand why this person should be a business continuity professional as opposed to a generalist manager or someone from the other disciplines. The other bit I struggle with is that resilience is about the whole organisation. Making sure the organisation has a resilient strategy, financial footing, identification of new threats, leadership. Therefore resilience is really about a philosophy within the organisation, culture, a way of thinking and organising the organisation. With this in mind, I believe it is the resilience professional’s responsibility to try and implement this across the organisation from top to bottom. However, the BCI has yet to come up with any tools or techniques on how this should be done. Resilience is evolving and I think we have yet to pin down where or what it is. Lastly, I am not sure the case study is about resilience. It fits better with crisis management dialogues; how incidents occur, which are usually due to multiple factors, rather than just one. If we find out more about TSB and KFC, I suspect they will have similar causes. To me, they are not about resilience. I am looking forward to seeing new research from the BCI and I’m interested to see where this resilience debate will go!